In 1775 when the American Revolutionary War broke out the American colonist did not have a very good chance of winning. Britain had a large well trained army and the best navy in the world. On the other hand the Americans had a disorganized collection of state militias and their navy was very small. However due to many factors, not the least of which was the determination and bravery of the American soldiers, the colonist pulled off an amazing upset and won their independence. Click here for a great selection of American Revolutionary War books at Amazon. On this page and the other pages of this site you will find lists of American Revolutionary War facts. There is information about how the colonist won, what the major battles were, where the war began and ended, and who some of the important and famous people of the American War of Independence were. We hope both kids and adults will find this information interesting. There were many events that led up to the war that prompted colonist to seek their independence from Britain. These events include the Boston massacre, the Stamp Act, Sugar Act, and the Quartering Act. Many colonists felt that they were being treated unfairly by Great Britain. One of the main complaints was that they were being unfairly taxed; one of the main rallying cries of the war was "No Taxation Without Representation". On September of 1774 twelve out of the thirteen colonies (Georgia did not attend) met in Philadelphia. This meeting was called the First Continental Congress. The purpose of the meeting was to discuss how to react to the Intolerable Acts passed by Britain. The first battles of the war occurred in April of 1775 in Lexington and Concord Massachusetts. Eight colonist and seventy British soldiers were killed. Starting in the summer of 1775, after armed conflict had begun, the Second Continental Congress started meeting. This group, over several months, gradually worked towards the signing of the Declaration of Independence in 1776. This Congress managed the war effort in numerous ways including raising an army, and developing a strategy. There were many major battles of the American Revolutionary War. Visit our page on these major battles. Although minor fighting continued for two more years the war basically ended in October 1781 when British General Cornwallis surrendered at Yorktown, Virginia. The Treaty of Paris officially ended the war two years later. The continental army had a lot of support from the colonist; most colonists were patriots. The colonists were fighting on their home turf with which they were very familiar; unlike the British who were not on familiar ground. The British had to wage war from across the Atlantic Ocean which was a huge disadvantage. Troops and supplies had to travel a great distance. The patriots received crucial aid from France in the form of supplies and military support. Military advisors like Marquis de Lafayette helped train the colonist in the art of warfare. The use of guerilla warfare tactics, not common at that time, often caught the British by surprise. The Americans had the great advantage of being led by General George Washington; one of the greatest military commanders in history. 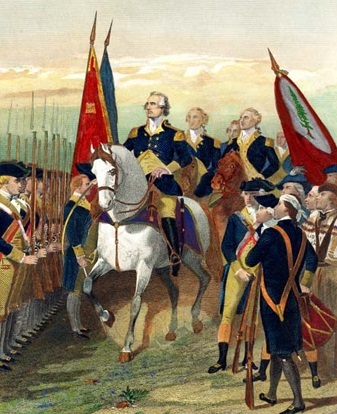 Please read the other pages on this site for more detailed American Revolutionary War facts on such topics as the events leading up to the war, the major battles, the famous leaders and generals, and much more.